My name is Claire Lorenzo, I’m a visual artist living and working in Brooklyn, NY. I’ve been creating hand-cut collages for nearly a decade. My source material draws on the yellowing pages from paperback books, vintage maps, National Geographic & Life magazines, black and white photographs, found postcards, and old handwritten letters. Last year, I sought to take my hand-cut collages off the wall and bring them into the third-dimension—as clothing and home-decor. In Pieces is the first foray into the collage + screenprinting process. Each t-shirt was screen printed by hand by Gowanus Print Lab in Brooklyn, NY and features one of my original collages. 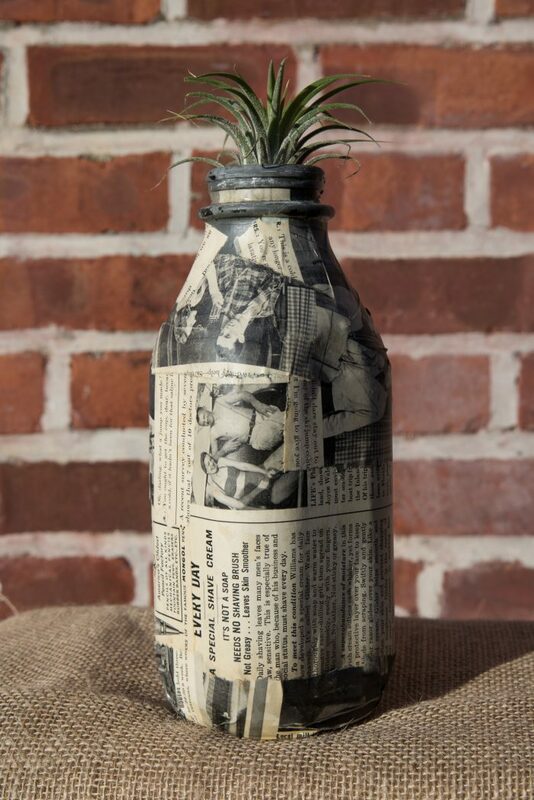 Each item of homeware is one-of-kind, collaged by hand from my grandmother’s old National Geographic & Life magazines. Every Christmas Eve in my hometown, “Santa” rides around the neighborhood on the back of a fire truck. I remember seeing the flashing red lights pour through the living room windows, and being so excited I could barely contain myself. My sister and I would run out onto our porch to wave to him, shivering in our socks on the cold cement, our winter coats over our pajamas. If you were lucky he’d throw you a candy cane. My work certainly favors a definitive aesthetic: vintage Americana. I’m very nostalgic and I’m obsessed with 1950s/60s American magazines. Your grandparents might look at some of my pieces and say, “I remember when that copy of Life magazine was sitting on our coffee table.” People my age are well aware of the desire to return to this nostalgia-obsessed aesthetic. Walk into any Anthropologie store or curated vintage boutique in Williamsburg and you’ll see what I mean.